The idea for this puzzle started a number of years back. I’d just watched a Bond film at the cinema and was taken by the fact that James Bond, Jason Bourne and Jack Bauer had first and surnames that started with the same letters. More than that, the first two are spies and had 4 letters in common – this suggested to me a puzzle in which there were two equally valid solutions. However, I would need the authors, as well as the spies, for the two lengths of the potential solutions to be the same. Serendipitously using I L Fleming and R Ludlum gave both solutions at 18 characters long. Even better, the option of overlaying them so the ‘L’ and ‘M’ coincided minimised the number of clashes that would need to be engineered to 9. Next, I needed a way for the solver to distinguish the correct spy. Having mulled this over for a while and got no inspiration I decided that a quote with ‘ambiguity’ appearing in the grid would be a good way to resolve the ambiguity. On searching the index of ODQ there was only one entry for ‘ambiguity’ but this was not appropriate. Again serendipitously the part of the quote listed for ‘ambiguities’ seemed particularly appropriate as it would describe what the solver would do. Adding the source to the grid was necessary to help solvers identify the quote (for those that spent ages searching the grid for the quote, my apologies, this was not my intention – my hope was that, for those that realised that there were two equally valid choices, solvers would realise that to resolve the choices part of the quote would have to cross one of the dual letter cells and that ‘ambiguities’ would stand out and they’d then check ODQ). I-spy Choices came next as the title for the puzzle. As some of my previous puzzle attest, I like games and like unusual grids. I spent some time trying to fit the thematic material into a grid that was in the shape of an eye. I played around with using half cells (along the diagonal) to make the shape more realistic. In the end it was resulting in a very wide grid that I wasn’t sure would be acceptable. I wasn’t convinced by the look of the ‘eye’ and don’t think I got a grid fill. Obviously it could have been done with a big enough grid. So I shelved that idea and reverted to a normal grid. I chose Bourne rather than Bond as the correct fill figuring that Bond was slightly better known and would trap more of the unsuspecting. In the process of filling the grid I noticed it was close to a pangram and decided to make it one. Pleased with my filled grid, I started cluing. To my horror, some way through this process I realised that I’d made a mistake and had an ‘E’ and ‘M’ clashing in the authors’ names where they shouldn’t be (see row 11 in second diagram)! The air went blue but fortunately for me it could be saved without too much rework at the expense of the pangram. Once I had the title I decided to give the solver the first letter to clue answers in the same way as the game. I thought it would be a different thematic gimmick to not include the first letter in the wordplays (remembering not to have any clues which had link words like x for y or x from y as not appropriate with such a gimmick). I did wonder for a while whether to have the Romeo and Juliet clues as ‘R See preamble (5)’ and ‘J See preamble (6)’ particularly as they are the phonetic code words and therefore defined by the start letter but decided against it. Ordering of the clues was dictated by the self publicising acrostic (longest entries starting with each letter) and then ordered alphabetically by length. Where there was more than one answer with the same start letter and length I ordered alphabetically on the second letter of the answer. I doubt that many if any noticed this ordering, or were helped by it, but I like a logical reason for how to ordered clues in a puzzle without numbers. Thanks as ever to Roger and Shane for all the work they do to ensure that puzzles in the Listener series are high quality and fair. My aim is to entertain – I hope I succeeded. A carte blanche with that unusual opening of the preamble, ‘All clues are thematically similar’ and the additional comment that we are going to find nine clashes. The other Numpty has worked out what the thematic similarity is and is happily running off answers while I laboriously colour code my grid identifying the lengths of words and cells. That device of listing clues by the opening letters of their solutions is a great help and when we spot PERSON-TO-PERSON ‘P Involving contact assigned to drunkard taken in by Prince Edward say (14)’ (P + ON TOPER in ER’S SON) our grid fill can begin. And in goes the ‘drunkard’, the ‘toper, and a few clues lower, I find ‘Y Maybe Guinness but not C Clinton studied here (4)’ (Y + ALE) I don’t need to look further for confirmation that Xanthippe retains right of admission to the Listener Setters’ Toping Club. Cheers Xanthippe – à Paris! Once we have that initial P in place, the grid fills steadily, when the only two three-letter solutions giving us NAS and EGM and by a stroke of luck initially going in the right places. We have a couple of hiccups when we put URAL and DAHL in the wrong places and struggle to fit ALBIGENSIAN (suggested by TEA), where we needed AMBIGUITIES but filling the grid is enjoyable because of those generous initial letters and soon we have a full grid. Now what? The other Numpty almost immediately spots JAMES BOND and feels that his work is done. ‘I spy’ – “Well he does, doesn’t he?” He leaves me to look for Ian Fleming but, consternation. Who do I find? R. LUDLUM. Something very fishy is going on here. Then I find I.L.FLEMING and the plot thickens. Of course JASON BOURNE is hiding in those clashes too – so that is why the preamble said ‘their creator’ rather than ‘his creator’. Was that a subtle hint? Montague Seal up the mouth of outrage for a while,/ Till we can clear these ambiguities,/ And know their spring, their head, their true descent,… Act V Sc.III Lines 216 to 218. Of course that obliges us to opt for the U of the E/U clash in AMBIGE/UITIES and, in effect, clears the ambiguities and spells out LUDLUM. What an inspired finish to the crossword. A superb compilation, many thanks to Xanthippe. Xanthippe’s last Listener was 18 months ago with its theme of the Adam Smith quotation “connections that unite the various appearances of nature”. That had a strangely constructed grid with basically four quadrants all linked together by the quotation. A more straightforward carte blanche this week with clues almost in alphabetical order of their answers and some clashing cells. For the endgame, we would need to identify a phrase from a quotation. This would be the first chance for my newly-acquired ODQ, courtesy of some Christmas gift cards, to be put to good use. 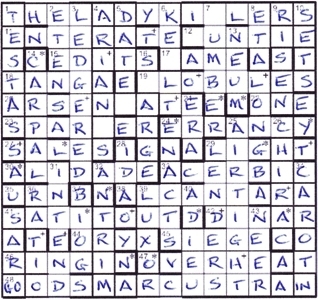 Actually, it didn’t take long to discover that the wordplay in each clue omitted the first letter of the entry. The first S 11-letter entry was an easy one, leading to SNOWBOARDER. Unfortunately, the A one wasn’t, partly because it was a bit of a tricky blighter: Meg is accepting liability, no latitude in English loopholes? (11) where Meg was short for megabyte and led to A + MB IS containing GUILT (liability) – L (latitude) + I (in) + E (English). In my first pass through the clues, well over half were solved, and I managed to slot a few into the grid. Unfortunately, the central 14-letter entry wasn’t one of them, and that was scarcely odd because… it was devious. Beginning with P, we had Involving contact assigned to drunkard taken in by Prince Edward say? (14). Wordplay: ON (assigned to) TOPER (drunkard) in ER SON — son of HMQ! This is the Listener, isn’t it?! Clue of the day was H Number put in Solway Firth principally are active when all ebbs (8), a perfect &lit. with TEN in S(olway) F(irth) + A (are) + A (active) all in reverse (ebbing). And so to the endgame. The clashes could be seen to spell out either JAMES BOND or JASON BOURNE, both heroes of spy novels, and either IL FLEMING or R LUDLUM, their authors. But which? We were told that the source of the quotation containing the three-word phrase appeared in the completed grid, although it lacked a conjunction. Well, ROMEO and JULIET were in the south-east quadrant, so that was what I scanned in my new ODQ. Five minutes later, and I was none the wiser. The only quotation that looked relevant was “How oft when men are at the point of death Have they been merry! which their keepers call A lightning before death.” I couldn’t find the last three words anywhere in the grid, so assumed that wasn’t the quotation. I looked up a few words in the ODQ index, including ambiguity — ambiguities wasn’t mentioned. Some of you are probably thinking that I should stay off the ‘sauce’ before tackling a Listener. Shame on you! After a couple of 30-minute sessions trying to work out what was required, I resigned myself to reading the whole of the play. How many three-word phrases were there likely to be? Before that — and don’t ask why, because I can’t remember — I decided to compare my old ODQ with the new. The old one had 41 quotations, the new 33. Well that was a big difference, so I scanned my old copy. I was on the verge of giving up when the very last one gave “Seal up the mouth of outrage for a while, Till we can clear these ambiguities.” Kerching! In the old but not the new. This confirmed that yank Jason Bourne, rather than good old James Bond, as the required spy, since R(obert) LUDLUM confirmed the U in AMBIGUITIES. Thanks for the challenge, Xanthippe. You nearly tripped me up, but it’s always nice to get there — in the end. I have refrained from sending a strongly-worded email to OUP! Some really enjoyable clues in this one – thanks Xanthippe! It took a decent night’s sleep to suss that it was all too simple – there had to be something else. So where was it? I fished the paper out again and there it was – JASON BOURNE and R(obert) LUDLUM. The ROMEO & JULIET in the SE corner looked the likely source of the quote, and a bit of searching revealed the apposite CLEAR THESE AMBIGUITIES. So JASON BOURNE and R.LUDLUM it is! It had been nearly six years since Elgin’s last puzzle. That was based on Kipling’s The Ballad of East and West, and before that, Wallace and Gromit’s The Wrong Trousers. I remember this last one as being a lot of fun (with it’s Batman and Robin red herring), and hoped we were in for some more with this one. Down answers had to lose a character and have the remainder jumbled before some more anagrams had to be made from the letters in the squares marked with * and + symbols. I decided that the acrosses were a good place to start. With 11 ENTERATE and 12 AUNTIE going in fairly quickly, I was up and running. Mind you, I wasn’t really sure of the wordplay for 12 Relative acceleration on horse that is dropping second (6) since I couldn’t see where the S for second worked; it turned out to be A + MOUNTIE – MO. A smattering of other entries around the grid led me to give the downs a go. 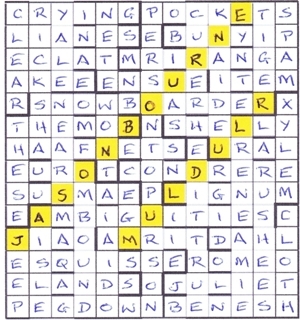 I started noting the likely letters to be dropped alongside each clue as solved. However, with the grid over half full, I wondered if it was more appropriate to note them above or below each column. Although the unching of the down entries was fairly generous, exactly what letters needed to be jumbled wasn’t particularly straightforward. All in all, there were tough clues, especially the acrosses, since they weren’t directly cross-checked. 24ac and 47ac took some analysis for me. 24 Fallibility when information is organised in emergency without them (7) was EMERGENCY – EM (them) with RAN (organised) replacing GEN (information) to give ERRANCY. 47 Shift temperature in excess: the answer? (8) was an &lit. clue with the T (temperature) in OVER (excess) THE A (answer) shifted right to give OVERHEAT. This turned out to be a long solving process, but eventually the grid, apart from most of the top and bottom rows, was finished. The squares marked with + gave TIOLETTRODHTES and would give an instruction (2,4,3,5). THE looked like the 3-letter word and, having toyed with — and dismissed — TS ELIOT and his TOILET, I tried TITLE and was rewarded with TO SORT THE TITLE. The jumble of DOING A SORT was, unfortunately, not immediately apparent. The squares marked with * gave CEMEYGANIDANOL, and I was again lucky to see COMEDY as a possibility there. AN EALING COMEDY was soon revealed. The two best known are The Lavender Hill Mob and The Ladykillers. The latter promptly got slotted into the grid. With that in place, I revisited the down answers to see what letters needed to be dropped. Hey Presto! 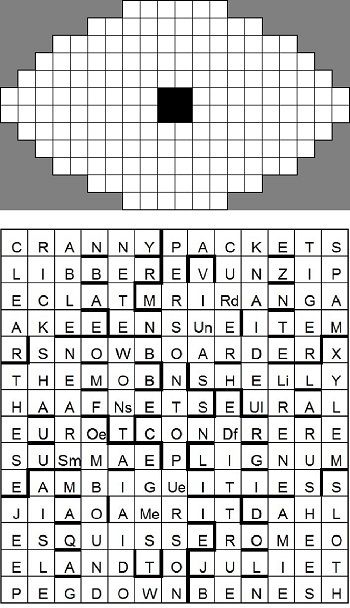 Courtney and Harvey went along the top of the grid, being dropped from the first word in each column. They were two of the ‘villains’ from the film. Two others were Robinson and Lawson which were dropped from the second down entries in each column. The only one left was MARCUS, played by Alec Guinness, and there he was in the middle of the grid. I often find that a bit of rough doodling of letters to be unjumbled works a treat. Here I stumbled across GADOOSTRIN and GOODS TRAIN jumped out at me. The two words could go at the beginning and end of the bottom row with GO and IN two of the squares to give SARGO and CAROTIN as the down entries. And there was still more. “A final thematic adjustment must be made, leaving some cells empty (no two in the same row or column)…”. If MARCUS dropped into the goods train, those letters were all from the same row. I flummoxed around for a bit, probably getting on for an hour on and off. Eventually I spotted the SIGNAL running diagonally above Marcus. In the film, this dropped into the stop position thereby hitting Marcus on the head and causing him to fall into the goods train below. Spotting the signal took me nearly an hour — penance for having been fairly quick with the anagrams. What a fantastic puzzle, and even better than Wallace and Gromit! A sheer joy to solve. Thanks, Elgin, and please don’t leave it so long till next time.